If You Didn’t Know Sarah Burton Before, You Do Now! The anticipation of today only really kicked in for me last night once the video of Sarah Burton (Designer for McQueen) began to circulate the net. The rumours of THE dress were flying up and down my Twitter feed and it was just too exciting. Watching the guests arrive to Westminster Abbey was a great start to an amazing day. As soon as I spotted Victoria Beckham in one of her own designs from her A/W11 collection and Phillip Tracey hat (which I have no idea how she kept that on her head!) my eyes began to water with sheer excitement! David Beckham, might I add, has not lost his touch at all eh ladies! I felt confident Kate’s dress would be McQueen but awaiting the details of it was intense. The moment she stepped out of her car, waving happily to the cheering crowds, was breathtaking. 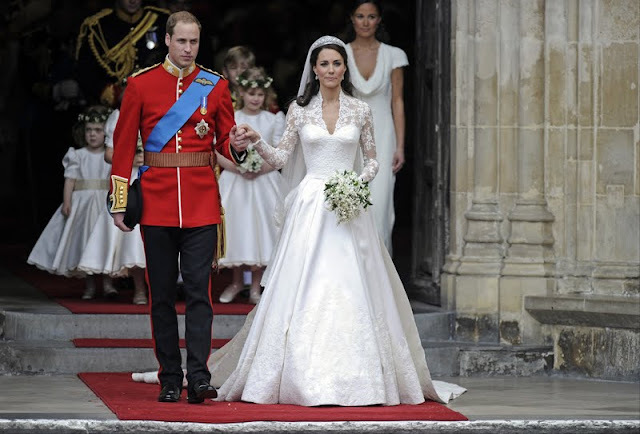 Channelling Grace Kelly with long intricate lace sleeves, fitted bodice and a rather lengthy train (2m70 to be exact), these were all the ingredients for the perfect dress. Rumoured to have cost £15,000 this amazing creation featured lace hand-made by the Royal School of Needlework at Hampton Court Palace. Workers were required to wash their hands every 30 minutes to keep the threads pristine and needles were renewed every 3 hours to keep them sharp and precise. Kate’s veil was held in place by a Cartier ‘Halo’ tiara, lent to her by the Queen herself and her earrings, a gift from her parents to be considered her ‘something new’. Her perfectly manicured nails (using Essie & Bourjois) were gifted to her by Camila and as a girl after my own heart, she chose to do her own make-up for the big day, a look (featuring an unusual technique with eyeliner) which is now being tried and tested by females the world over! Kate’s second dress of the day is another Sarah Burton creation (and yes including the questionable fluffy angora cardi – we’ll let that one slip!) has a similar silhouette to the wedding dress and features a heavy crystal belt, fitted satin bodice and circular satin skirt.